One of the nation’s biggest music labels briefly signed Taylor Swift to a contract but let her go because she didn’t seem worth more than $15,000 a year. At least four book publishers passed on the first Harry Potter novel rather than pay J.K. Rowling a $5,000 advance. And the same pattern happens in nearly every business. Anyone who recruits talent faces the same basic challenge, whether we work for a big company, a new startup, a Hollywood studio, a hospital or the Green Berets. We all wonder how to tell the really outstanding prospects from the ones who look great on paper but then fail on the job. Or, equally important, how to spot the ones who don’t look so good on paper but might still deliver extraordinary performance. George Anders sought out the world’s savviest talent judges to see what they do differently from the rest of us. 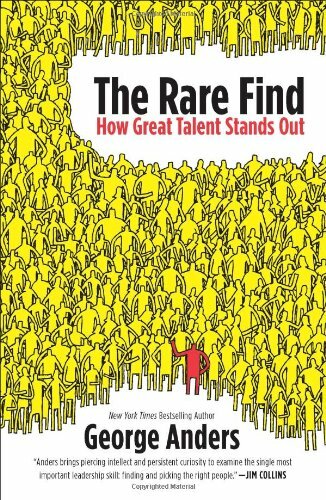 In The Rare Find, Anders draws on the best advice of these and other talent masters to reveal powerful ideas you can apply to your own hiring. Look for the hidden virtues. One of the most overlooked strengths in America today can be expressed in one word: resilience. Find your unlikely stars by noticing what others don’t see. The best assessors in any field are constantly learning something new about their subjects. Push your best candidates to grow even stronger. Motivation reveals itself as the selection process plays out. The most intriguing candidates often don’t fit into any pile. These are the candidates who don’t have smooth, well-rounded credentials to date. They show up with a tantalizing, jarring combination of promise and pitfalls. They are jagged résumés.The cautious answer in such situations is to shunt such candidates into a another pile: the “maybes.” That way, no one needs to make a decision for a while. Compromise on experience; don’t compromise on character. Be willing to embrace unconventional views of what skills are truly needed in each specific field. Your own career is a template; use it. The best insights into candidates’ potential come from leaders whose own life experiences speak to the traits they are seeking. Break down barriers that restrict where you look. 1. Widen your view of talent. The best assessors in any field look at people differently. These judges all have the courage to focus on candidates’ underlying character and motivation, rather than sticking merely to classic measures of experience. Credentials and job history still matter, but they aren’t the whole show anymore. Once some basic level of competency has been established, the key question stops being: “What can you do for us today?” Instead, it becomes: “What might you be able to do for us years from now?” The payoff from this bolder, more forward-looking perspective can be huge.Compromise on experience; don’t compromise on character. Seek out “talent that whispers.” On the fringes of talent, ask: “What can go right?” Take tiny chances — so you can take more of them. 2. Find inspirations that are hidden in plain sight. Patterns that may be difficult to see in one realm can be stunningly clear in others.Draw on the “hidden truths” of each job. Many organizations are in too much of a hurry to get started with the drama of screening candidates, without ever fully knowing what the hunt is all about.Be willing to use your own career as a template. Rely on auditions to see how and why people achieve the results they do. Master the art of aggressive listening. 3. Simplify your search for talent. Be willing to pick one trait that matters more than anything. Often the ability to recover from setbacks is what separates people who surpass expectations from those who disappoint.Be alert to other invisible virtues, too. Insist on the right talent. Push your best candidates to grow even stronger. Become a citadel of achievement. Mar 14 43 Lessons from the book "Winning Decisions: Getting It Right The First Time"